LANSDOWNE, Va. – Amherst College in Massachusetts is the 2016 recipient of a $1 million prize awarded by the Jack Kent Cooke Foundation to a selective college or university with an excellent record of admitting, supporting and graduating outstanding low-income students, Cooke Foundation Executive Director Harold O. Levy said today. The Cooke Prize for Equity in Educational Excellence is the largest award in the nation given to an elite college for eliminating arbitrary barriers to admission and promoting the success of high-achieving students from low-income families. “By awarding Amherst the Cooke Prize we want to call attention to the college’s success in lowering barriers to equal educational opportunity, and show other colleges and universities strategies they can pursue and steps they can take to follow Amherst’s example,” Levy said. Amherst is a liberal arts college with 1,790 undergraduates. It meets the full demonstrated financial need of all admitted students without requiring loans. The college’s admissions review is a need-blind process, including for transfer applicants and foreign students. A total of 58 percent of Amherst students get need-based financial aid and the college provides no merit aid. In addition, Amherst provides low-income students with funding for educational travel and study abroad, stipends for otherwise unpaid internships and career development mentoring. It also has programs to meet the social, psychological and health needs of all students. Amherst’s percentage of low-income students receiving federal Pell Grants has risen from about 15 percent in 2006-07 to nearly 25 percent in the current academic year. The college has also increased enrollment of community college transfer students – many coming from low-income families – from zero or one annually to 12 to15 each year. In contrast to Amherst, a recent study by the Cooke Foundation found that only 3 percent of students at top colleges across the U.S. come from the poorest 25 percent of families. But 24 times as many – 72 percent – come from the wealthiest quarter of families. Martin said Amherst will use at least half of the $1 million Cooke Prize to fund summer programs for its low-income students, including research with faculty, field study, arts training and internships. She said the college will also use funds from the Cooke Prize to recruit, train and pay students receiving financial aid to serve as financial aid peer advisers for transfer and first-generation students, supplementing work of its Financial Aid Office. Because about half the students remaining on the Amherst campus during breaks are from low-income families, Amherst will create more programs during breaks to reduce their sense of isolation, Martin said. 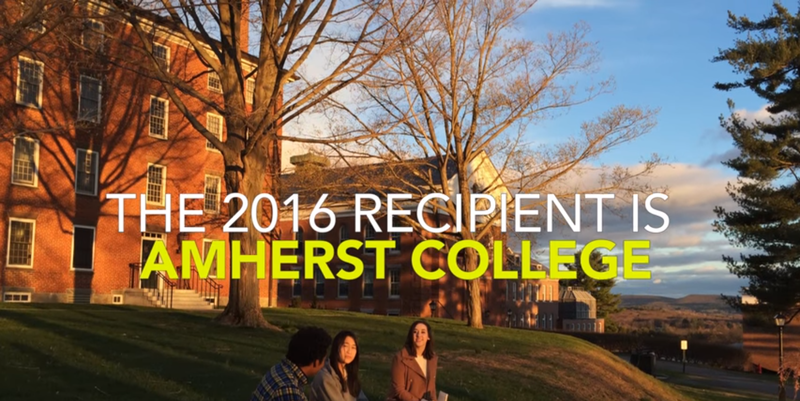 Amherst was selected as the Cooke Prize recipient based on six criteria dealing with outstanding low-income students: outreach to attract such students; admissions; enrollment; financial aid; acceptance of community college transfer students; and degree completion. Other finalists for the Cooke Prize were: Davidson College in North Carolina; Pomona College in California; Rice University in Texas; and Stanford University in California. The Cooke Prize was first awarded in 2015, going to Vassar College in New York. Vassar raised its percentage of low-income students (those eligible for Pell Grants) by 11 percent since 2008 – more than any other college ranked “most competitive” by “Barron’s Profiles of American Colleges.” About 23 percent of Vassar’s freshmen are eligible to receive Pell grants.